A group of Chinookans of the Lower Columbia River painted by traveller Paul Kane in the early 1800's. The following summary of Chinookan society in the Wapato Valley region is taken, and slightly modified from, a recent report of the Wapato Valley Archaeology Project (see below for reference). Much of what we know comes from written records made by Europeans when they first arrived; the earliest recorded Europeans arrived in 1792, but some few may have been here several years earlier, though no sooner than the 1750's. The term Chinookan refers to the speakers of several closely related languages who occupied the Columbia River from the upstream end of the river's gorge (near the present town of The Dalles, Oregon), and the river's mouth, and along adjacent portions of the present coasts of Washington and Oregon, from Tillamook Bay in the south, north to Willapa Bay in southwest Washington. This region has been called the Greater Lower Columbia River by Hajda, in her synthesis of Chinookan ethnohistory and ethnography (Hajda 1984). Hajda's work is presently the definitive study of the Chinookan peoples at contact with Europeans, while Boyd's work is the basic study for Chinookan demography through the first century of the Modern period. Silverstein (1991) provides a useful summary of what is known of Chinookan life before contact and their contact history. The Chinookan language family can be divided into two branches: Lower Chinook spoken by peoples living on both sides of the river's mouth, and Upper Chinook spoken along both sides of the Columbia from its estuary upriver through the Gorge. Upper Chinook is divisible in three languages Cathlamet, Multnomah and Kiksht. Multnomah was spoken in the Wapato Valley, where the region's densest human populations occurred. Boyd and Hajda (1987) suggest that the Valley's permanent winter population more than doubled every spring by the peoples moving into the area to exploit its abundant seasonal food resources. Boyd (1985) estimated that the resident population of the basin two centuries ago was 4000 people with the numbers rising to perhaps 10,000 during spring and summer. His estimates are probably lower than pre-contact levels because the people of the region were afflicted by smallpox in the early 1770s and again in 1801. His figures translate to a winter population of approximately 16 people/100 sq km in winter and 40 people/100 sq km during the summer (Alfred Kroeber estimated 28 people/100 sq km for the Northwest Coast as a whole [Ramenofsky 1987]). Dobyns' (1983) estimates for the pre-epidemic population of the Northwest Coast are between 116 and 120 people/100 sq km; his figures are controversial but may provide an upper limit on the winter population of the basin, which would have been between 29,000 and 30,000 people or three times the contact-period numbers. Whatever set of figures one chooses, these are high densities for hunter-gatherers (Wobst 1974, 1976). Boyd and Hajda report 16 named Multnomah and Clackamas villages in the area covered by this study, including immediately adjacent portions of Oregon (Table 4), based on Lewis and Clark's Journals (Thwaites 1904-1905). These 16 villages had a minimum population of 3400 people, perhaps representing the permanent population of the basin, and a maximum estimated population of 8040, representing, they argue, the effects of the annual influx. Boyd and Hajda's figure of 8040 represent a minimal figure for the pre-epidemic permanent population of the Wapato Valley, with the actual figure probably being closer to 12,000 to 14,000 (Ames 1994). Chinookan peoples were hunter-gatherers exploiting a wide range of terrestrial and riverine resources. The Wapato valley is an ecologically complex and productive environment (Saleeby 1983, Hamilton 1989). Its productivity is the result of its being quite fine grained in habitat structure, thus providing a wide variety of microenvironments and ecotones. As has been indicated, the area supported a diversity of plant and animal life. In addition, the Columbia River was the most productive salmon stream in the world. Among the staples in the Chinookan subsistence system in the valley were wapiti (elk) (Cervus elephas), deer (Odoceolious spp. ), bear (Ursus), wapato corns (Sagittaria latifolia), camas roots (Camassia quamash), salmon (Oncyrhinchus spp. ), sturgeon (Acipenser spp. ), and smelt (Spirinchus thalerchthys), among others. Click here to learn more about the Chinookan natural environment. 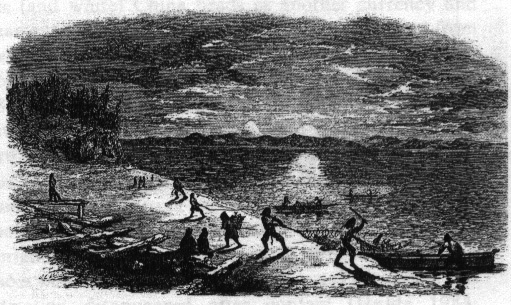 Chinook people harvesting salmon, by moonlight, with nets,clubs, canoes and other equipment. Like most peoples of the Northwest Coast and Columbia Plateau, the household and village or town were the primary economic, social and politic units. The household was the most important. Households ranged in size from a score of people to well over a hundred. Households occupied large, cedar plank houses that ranged in size from as little as 90 m2 to well over 1000 m2. 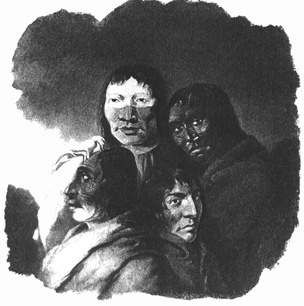 Chinookan societies were stratified, divided into classes of free individuals and slaves. Mitchell (1985) estimates that perhaps 25% of the area's population were slaves. Free people were divided into a relatively powerful elite and commoners who were household members but who exercised little or no power. Towns were linguistically polyglot, given the area's marriage practices, so while a town such as Cathlapotle was within Chinookan territory, its occupants would very likely include Cowlitz and other peoples of the region. Chinookan people generally shifted their residence twice a year, from a winter village or town, to summer locations. Click here to learn more about Chinookan plankhouses. In the Wapato Valley, it appears that the occupants were fully sedentary, with people remaining in the same settlement year-around. Excavations of a plank house at 35CO5 (the Meier site), on the Oregon side of the Columbia river, indicate the structure stood for 400 years and was continuously occupied. The Chinookan peoples were deeply involved in trade. An annual trade fair at The Dalles was the largest such fair in Western North America, and any movement of materials between the coast and the fair passed through Chinookan territory. The Dalles trade fair itself was within the territories of Kitsht speakers. The Chinook were also engaged in trade up and down the coast itself. The town of Cathlapotle (just a few miles from the Meier site, on the opposite bank of the Columbia River) appears to have been among the largest towns along the river. It also was strategically located vis a vis any movement up or down the river. It is perhaps suggestive that both Broughton and Lewis and Clark were met by peoples from Cathlapotle. Chinookan model of a canoe: note the distincitve paddles. To the Chinook, a canoe would have been the equivalent of a car for modern Euroamericans, used for all variety of travel on the Columbia. ...on the North side of the columbia a little above the entrance of this inlet a considerable river discharges itself. this stream the natives call Cah-wah-na-hi-ooks. it is 150 yards wide and at present discharges a large body of water, tho'from the information of the same people it is not navigable but a short distance in consequence of falls and rappids a tribe called the Hul-lu-et-tell reside on this river above it's entr.- at the distance of three miles above the entrance of the inlet on the N. side behind the lower point of an island we arrived at the village of the Cath [X: Quath]-la-poh-tle wich consists of 14 large wooden houses. here we arrived at 3 P.M. the language of these people as well as those on the inlet and wappetoe Island differs in some measure from the nations on the lower part of the river. tho' many of the words are the same, and a great many others with the difference only of accent. the form of their houses and dress of the men, manner of living habits custom &c as far as we could discover are the same. their women wear their ornaments robes and hair as those do below tho' [NB: Indian women on Wappato Island & in that Valey] here their hair is more frequently braded in two tresses and hang over each ear in front of the body. in stead of the tissue of bark woarn by the women below, they wear a kind of leather breech clout about the width of a common pocket handkerchief and reather long. the two corners of this at one of the narrow ends are confined in front just above the hips; the other end is then brought between the legs, compressed into a narrow foalding bundel is drawn tight and the corners a little spread in front and tucked at the groin over and arround the part first confind about the waist. the small robe which dose not reach the waist is their usual and only garment commonly woarn be side that just mentioned. when the weather is a little warm this robe is thrown aside and the leather truss or breech-clout constitutes the whole of their apparel. this is a much more indecent article than the tissue of bark, and bearly covers the mons venes, to which it is drawn so close that the whole shape is plainly perceived. the floors of most of their houses are on level with the surface of the earth tho' some of them are sunk two or 3 feet beneath. the internal arrangement of their houses is the same with those of the nations below. they are also fond of sculpture. various figures are carved and painted on the peices which support the center of the roof, about their doors and beads. they had large quantities of dried Anchovies strung on small sticks by the gills and others which had been first dryed in this manner, were now arranged in large sheets with strings of bark and hung suspended by poles in the roofs of their houses; they had also an abundance of sturgeon and wappatoe; the latter they take in great quantities from the neighbouring bonds, which are numerous and extensive in the river bottoms and islands. the wappetoe furnishes the principal article of traffic with thesepeople which they dispose of to the nations below in exchange for beads cloth and various articles. the natives of the Sea coast and lower part of the river will dispose of their most valuable articles to obtain this root. they have a number of large symeters (scimitars, or swords) of Iron from 3 to 4 feet long which hang by the heads of their beads; the blade of this weapon is thickest in the center tho' thin even there. all it's edges are sharp and it's greatest width which is about 9 inches from the point is about 4 inches. the form is thus. this is a formidable weapon. they have heavy bludgeons of wood made in the same form nearly which I presume they used for the same purpose before they obtained metal. we purchased a considerable quantitiy of wappetoe, 12 dogs, and 2 Sea otter skins of these people. ...we proceeded on to the lower point ofthe Said island accompanied by the 3 Indians, & were met by 2 canoes of nativs of the quath-lah-pah-tal who informed us that the chanel to the N E of the Island was the proper one. we prosued their advice and Crossed into the mouth of the Chah-wah-na-hi-ooks River which is about 200 yards wide and a great portion of water into the columbia at this time it being high. The indians inform us that this river is crouded with rapids after Some distance up it. Several tribes of the Hul-lu-et-tell Nation reside on this river. at 3 oClock P. M. we arrived at the Quath lah pah tle Village of 14 Houses on main Shore to the N E. Side of a large island. those people in their habits manners Customs and language differ but little from those of the Clatsops and others below. here we exchanged our deer Skins killed yesterday for dogs, and purchased others to the Number of 12 for provisions for the party, as the deer flesh is too poore for the Men to Subsist on and work as hard as necessary. I also purchased a Sea Otter robe. Archaeological Investigations (1991-1996) at 45Cl1 (Cathlapotle), Clark County, Washington. A Preliminary Report. by Kenneth M. Ames, Cameron M. Smith, William L. Cornett and Elizabeth A. Sobel. January 1999 Wapato Valley Archaeology Project Report #6. Portland State University & U.S. Fish and Wildlife Service. Click HERE for an online version of this report (including bibliographic references). This website created and maintained by Cameron M. Smith.